In 2014, Abstract Art is not new, nor is it foreign to the viewer when describing what kind of ‘art’ is on exhibition. Artists working in this overall genre of “abstraction” today owe their freedom to experiment to the Artists who challenged the artmaking of their time. They pushed the boundaries to create a new genre of art, now named and accepted throughout art history. Abstraction NOW, references art history while exploring the concepts of what Abstract Art is now. In this exhibition, we can see influences from many different Abstract Art genres, from the Minimalist qualities found in the blue pebble works by Lezlie Tilley and the obsessive markmaking of Bruce Roxburgh’s delicate works on paper to the Abstract Expressionist aesthetic of Caelli Jo Brooker, Anne McLaughlin and Priya Joy’s paintings. While suggestions of Futurism and Cubism are referenced in Alison Smith’s drawings and Ahn Wells’ paintings and wall sculpture. While the Artist’s work in this exhibition can be written about and given art history descriptions, the making of the work and the inevitable public display for an audience, is the most important part for an artist’s job today. 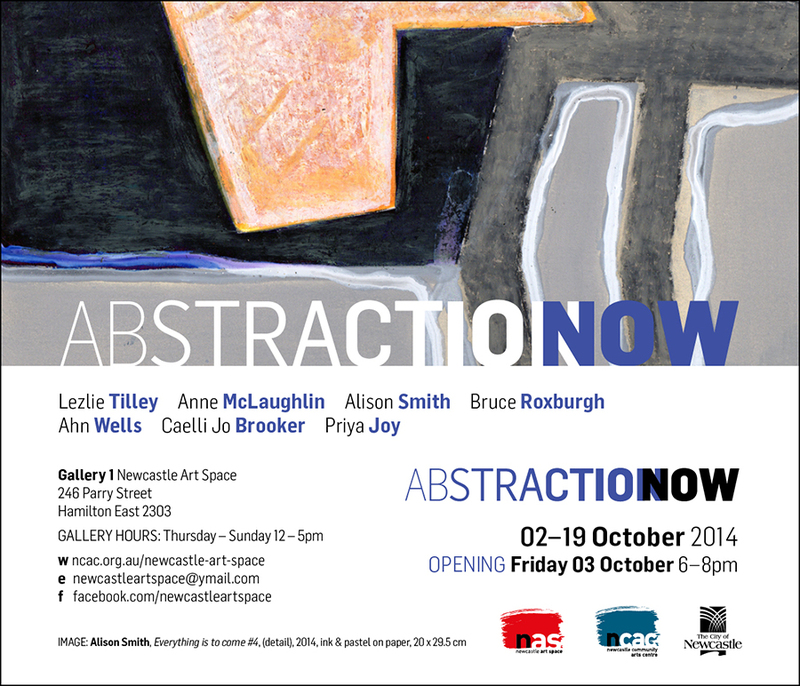 Abstraction NOW, has been brought together and curated with this idea in mind, I hope you enjoy the show.